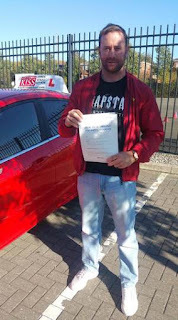 Kamil passed first time trying with just 4 driver faults after just 30 hrs of training. A naturally gifted driver!! 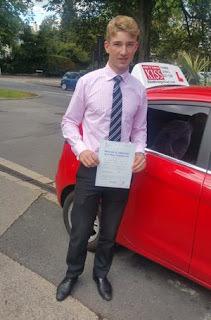 Well done Kamil and safe driving for life from Driving Instructor Tymek and everyone at KISS. 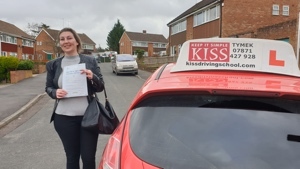 Jana passed her driving test in Gloucester at her first attempt after just 28 hrs of training from scratch. 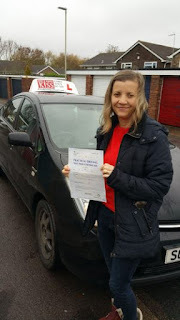 Driving Instructor Tymek remarked that she was so shocked when she found out she had passed. Priceless! Congratulations to Jana from Tymek and everyone at KISS. Jasper passed his test first time at the Gloucester test centre. Now he can drive his sisters to school, helping his mum with that, and going himself to Hartpury college to be a Premier league player. Driving Instructor Tymek said that he is going to get from him a set of delicious tea selection, as he got to know me not only teaching to drive but also serving my tea to him. Tymek always promises to all his students to serve them every time different blend of black and fruit tea. Congratulations to Jasper from everyone at KISS. Denis passed his driving test after 14hrs training with Driving Instructor Tymek. 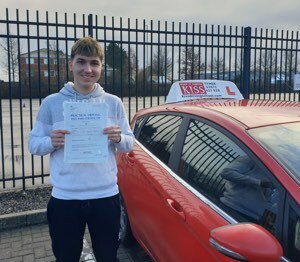 He had failed 3 times before with another instructor from another driving school. 3 minor faults this time though! Tymek says that it's becoming a norm to get his students with 2-3 minor faults. Well done Denis from Tymek and everyone at KISS. Andrew passed his test in Gloucester with just 3 minor faults. No more riding all year round on his 125 bike, commuting around 20k miles a year! 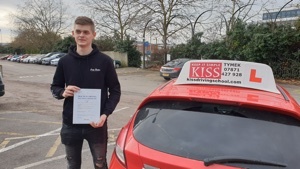 Well done Andrew from KISS Driving Instructor Tymek and everyone at KISS. 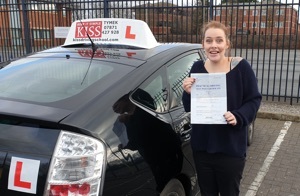 Nicole passed her driving test in an automatic Toyota Prius at the Gloucester DTC with just two minor driver faults. KISS Driving Instructor Tymek said that he cannot remember how often he had to remind her in the last sessions that she is a very good driver. It must have been a few dozen times at least but it paid off for her. She's been infectious with her positive, life-loving attitude. Look at her smile! She even hugged the examiner at the end. I am not sure if he'd ever experienced that in his job!! Congratulations from all of us at KISS. 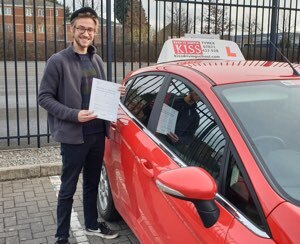 Ryan passed his driving test in Gloucester with just one minor fault after taking 5 hrs of lessons with KISS Driving Instructor Tymek, including test time. He has had a driving licence for a long time but had to retake the test. He used to drive vans, so no wonder that his observation is spotless, no coasting either, which is common among most of the experienced drivers. After Tymek's initial assessment, there wasn't much to do. Just ironing out few details. Congratulations to Ryan from all of us at KISS. 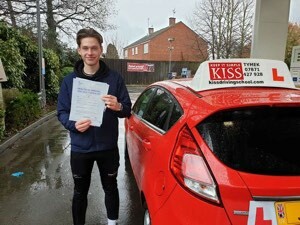 Winston passed his driving test at the Gloucester DTC with just one driver fault. It took KISS Driving Instructor Tymek 4 laborious (sic) hours to get him to the test standard. Winston is surely driving his car as we write this, after 4 months having it waiting for him on his driveway. Congratulations from all of us at KISS. This is Alina who passed her driving test at the Gloucester test centre with only 3 minor faults. KISS Driving Instructor Tymek said that she is his first student taking and passing a driving test on my automatic hybrid Toyota Prius. Smooooth drive Alina in the smooooth car. Well done from all of us at KISS. Eddie passed his driving test at the Gloucester DTC at his first attempt with just 5 minor faults. Bearing in mind that it took him to achieve that from scratch in just 20 hours, including the test, is remarkable!! KISS Driving Instructor Tymek said that he is so proud of you Eddie. Congratulations and safe driving from all of us at KISS.